With this whole KonMari project going on, I’ve been thinking a lot about happiness lately. Happiness and decision-making, happiness vs functionality, happiness in body image, etc. Today I want to discuss happiness, clothes, shame, invisibility, and PTSD. Choosing and wearing clothes that make me happy is a relatively foreign concept for me. Generally, I’ve chosen clothes that are functional, practical, average, “normal,” muted, shielding, and that lend themselves to invisibility. No one pays attention to your clothes when you wear a plain t-shirt and generic jeans, you know? And if your clothes make you invisible, no one truly looks at you. PTSD made invisibility a relief. All the bullying in adolescence changed me from a happy, confident extrovert to a silent, hyper-vigilant introvert. As a child, my parents laughingly nicknamed me “bucket-mouth” because I never shut up. In middle school, I would go days – weeks – only speaking if directly addressed by teachers. As an adult, I began to regain my natural extroversion, but I still strove for invisibility, especially when obese. One of my reasons for wanting to lose weight involved wishing to be visible/invisible by chose (impossible when morbidly obese). 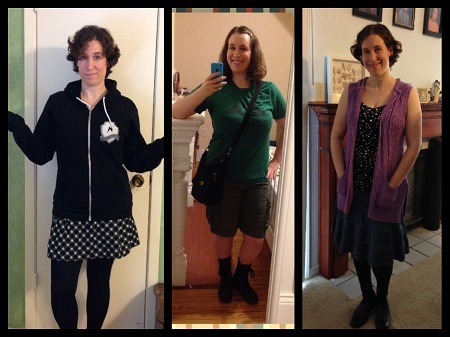 I gained a certain amount of confidence as I lost weight, and began exploring my personal style. Mostly, though, I continued to dress nondescript. 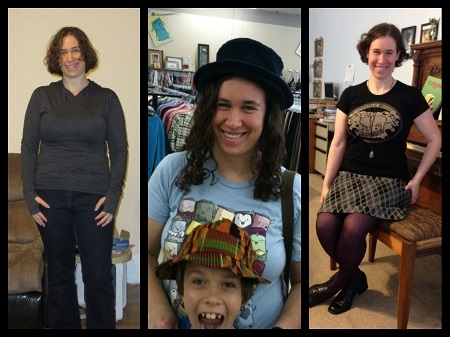 Clothing can make you super visible, and while I loved my style, it was too anxiety-inducing to dress that way all the time. My outfits, shoes, accessories, bags, and makeup continued to trend toward the invisible. One of the most difficult parts of the KonMari clothing portion was dealing with clothes that made me “safe” instead of “happy.” Nearly all my clothes fall into the former category. If I got rid of all the socks that didn’t bring me joy, for instance, I’d literally have no socks. My socks are practical and safe, not fun or joyous. But I want my clothes to bring me joy. All my clothes. When I wear clothes that make me happy, I feel more confident, and love myself more – regardless of my size and regardless of what people think of me. It might take me some time to get to where I can dress this way all the time – clothes are expensive, and exposure is hard – but I hope to be there one day. 1. The only way I liked this first dress was with a jacket, making it look boyish. Never wore it in public. 2. Love cargo shorts/pants and clomper boots and boys’ clothing. 3. Loved this sleeveless sweater hoodie, too, but never managed to wear it outside the house. 1. This shirt was so much fun, but I knew I’d never wear it in public so I didn’t buy it. 2. I could only wear this dress for Halloween. 3. Loved this sweater, but the color made me too conspicuous, so I only wore it indoors. 1. Love layers but they make me feel fat and self-conscious. 2. This coat made me feel like Snape! But it also made me feel fat, so I never wore it. 3. Cargo pants and rusty-orange shirt made me feel fantastic but (again) too self-conscious. Sigh. This is kinda like my personal fashion pinterest board, since I don’t actually have pinterest. When you wear clothes that are “normal” or like everyone else, but that also make you uncomfortable, you are going to look uncomfortable. When you love the clothes you wear, regardless of what anyone else thinks about them, you’re going to feel fantastic. Take a chance, find what you love, and start living out loud. No matter your size. No matter how people judge you. No matter what anyone thinks. I know it’s hard to believe me, but really, people react far more to how you feel about what you’re wearing than to the clothes themselves. This entry was posted in Wellness and tagged body image, KonMari, psychology, Wellness Wednesday. Bookmark the permalink. 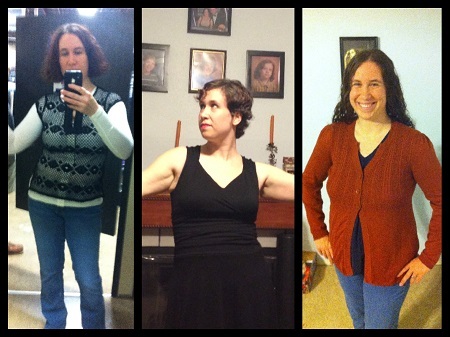 I am kind of the opposite of you in this…the fatter I get, the more flamboyant my clothing. 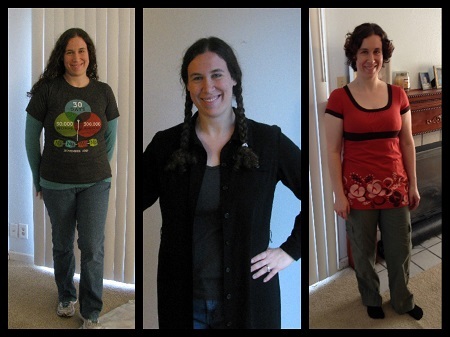 The thinner I get, the more I can wear “normal” clothing like jeans and t-shirts. I think of being outsized as showing a big “I don’t care what you think” sign to the world. Yes, sometimes being fat and middle-aged makes me invisible, but at six feet and more than 200 pounds, I’m kind of hard to overlook. I think that’s what I was trying to get across. When you’re overweight/obese, you aren’t invisible, unless people (like store clerks!) choose to ignore you. You don’t have the choice. At a normal weight, I could be as invisible or visible as I chose. I never felt under scrutiny the way I did when I was obese. But then again, I’ve never mastered the art of the “I’m fat and f-you” attitude, heh. So I try to draw as little attention to myself as possible when obese. I understand how you feel. There are certain clothes I wear when I am having an off-day physically – when I’m bloated or not feeling well. However, as I have gotten older, I embrace bold colors and putting myself out there fashion-wise. There is nothing I like better than a pair of colored tights. The interesting part is that when I am at home, I tend to dress down and in the baggiest, most unflattering clothes I own. This gets me in trouble with unexpected guests or when we want to pop out suddenly on errands or for dinner. I wish I was one of those people who dressed nicely all the time no matter where I am. I feel so much better when I do.